It is nice to have a minimalistic outfit once in awhile. Plain? Yes. Boring? No. In fact, a simple look can be quite refreshing; and that is exactly what I need after being overloaded with patterns lately. I love how each of these black and white pieces has its own character. White top with mesh detailing, black leather skirt with asymmetrical hem, London Sole ballet flats with classic quilted pattern, and Lauren Merkin Simone bag in the most buttery soft speckled leather that I am totally obsessed with! White mesh chiffon top c/o OASAP. Simone bag in white/black rfc leather c/o Lauren Merkin. Henrietta ballet flats in black quilted leather c/o London Sole. I LOVE this outfit! I was considering getting that top too. Wish I did because it looks amazing. Perfect. I like your skirt. Love black and white, they are not boring! Oh my goodness, that bag is soooo awesome!! That skirt is so funky! 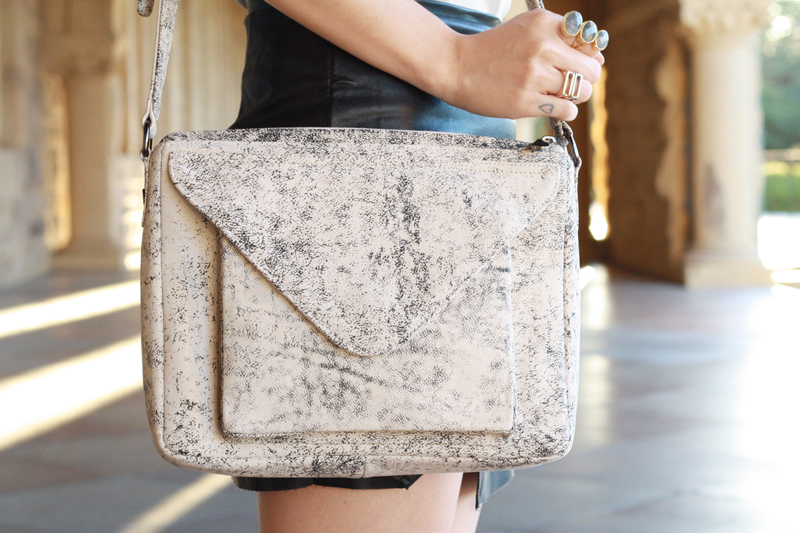 I love the edgy cutout and that bag is just perfect with it! Stunning outfit, I absolutely love it....not boring at all...I think simplistic can often be the most striking! Love this look! Your skirt is perfect! This outfit has so many cool details! I love the sheer detailing on your blouse. The cut of that leather skirt is fantastic too! I'd love to wear an outfit like this.